The Kings Arms is reputed to be haunted by the sounds of phantom footsteps that scurry the upstairs corridors and up and down the stairs. 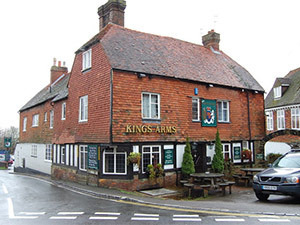 Pictured is the Kings Arms courtesy of Julian P Guffogg. Rotherfield is a village in East Sussex, England. It is situated on the B2100 to the east of Crowborough. Pictured left is the Main street in Rotherfield courtesy of Sandpiper. Licensed under CC BY-SA 3.0 via Wikimedia Commons.